First you need to get an account. Then before you can trade or really do anything, you need to verify by uploading address and identification. This is because CryptoFacilities is a regulated City of London exchange, and they need to do full KYC/AML in order to comply with regulators. It shouldn't take more than a day or two to complete verification and be ready to trade. Once verified, you can deposit. The site is 100% bitcoin. Deposit to the address. Each contract is worth 1 bitcoin, the margin requirement for shorting is 0.16 and the margin requirement for longing is 0.2, so you get 5x long and 6x short. There are 6 different contracts you can trade: 1 week, 2 week, 3 week, 4 week, quarterly, semiannually. There are three order types: MKT (market), LMT (limit), and STP (stop). If you want to open a long position and earn money when the price of bitcoin goes up, you just buy the number of contracts (coins) that you want: so click the "buy" button. If you want to earn money when the price is going down, just SELL a contract. Remember you don't have to own a contract to sell one, you can just open a short position simply by selling even when you have a flat exposure. If you find this concept of "selling" a contract you don't own, please see the Bitcoin Futures Guide here. If you put a limit order in for a sell above the current market price/mid point, the price will have to go up to get it filled. Or you can market sell and you will hit the nearest bid and then any drop in the price from what you are filled at will be profitable for you to exit position or at settlement/expiration of the countract. You can easily type in the price and size (remember 1 contract = 1 bitcoin) and use a quick selection of the price by the last, mid, bid, and ask on the contract. Underneath the order panel you have the Open Orders which show your unfilled open orders, and the Open Position tab will show the active filled orders and active exposure you have long or short. Remember: on CryptoFacilities you can't hold simultaneous long and short on the same contract, but you can on different contracts. Notice that it shows your margin requirements as well as estimated price points where you will reach Initial Margin, Maintenance Margin, and Liquidation Thresholds (as well as Termination, when you can't get filled on liquidation and your balance is transferred to counterparties). 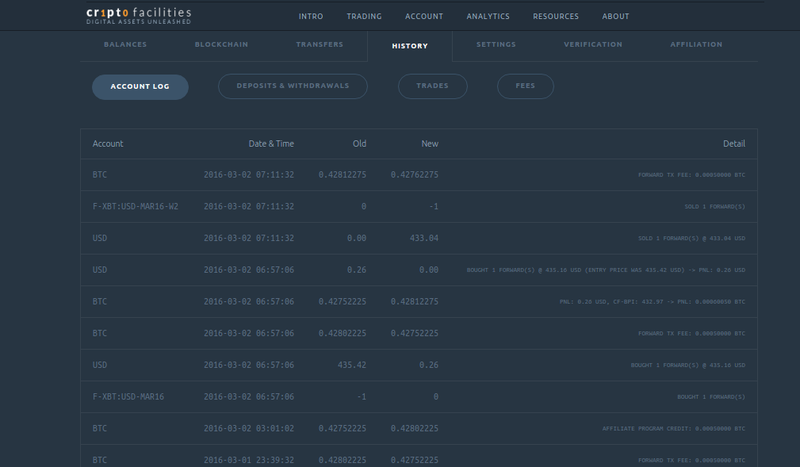 You can easily manage your balance that is used for positions here and monitor the progress of your trades. You can see your balance settled daily and verifiable on the blockchain. This means no matter when your contract expires -- whether in one day or in 6 months -- you will be able to settle your Pnl on a daily basis. This is what bitcoin is all about: transparency and verifiability, trustlessness achieved. You can export it all to a CSV and have a full record of all activity and changes in the balance. Every satoshi is accounted for in CryptoFacilities secure system and platform. Right now CryptoFacilities has only contracts in Bitcoin, but they have recently announced an exciting partnership with Ripple, so you will be able to soon trade XRP derivatives in order to hedge any risk exposure you have on that or to speculate on price going up and down. 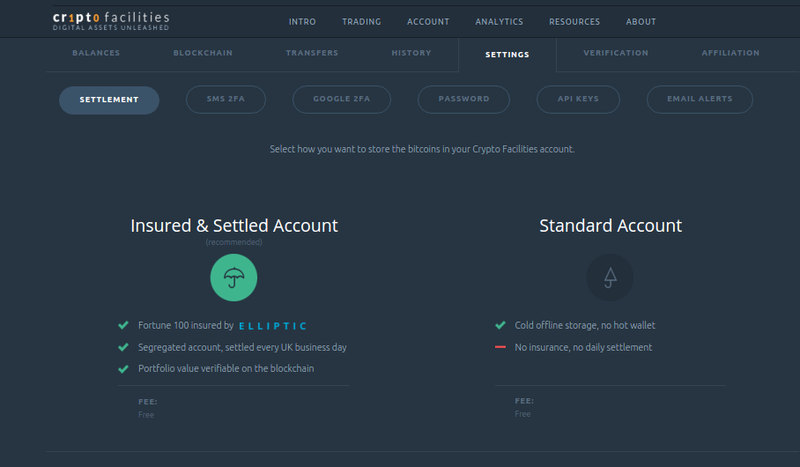 Sign up with CryptoFacilities now and get a welcome bonus once you verify and start trading.